Data labels highlight important data points on a chart. They identify exact numbers. You can customize data labels in a variety of ways to make them stand out more clearly on the chart. For example, you can change the position, angle, color, or size of data labels. For instructions on how to open these dialog boxes, see the procedures in Using Data Labels Properties. The Format Labels dialog box contains options for editing data labels. Bar, line, and area charts share the same tabs. Use the General Options tab to add data labels to a chart and set their position, angle, and radius. The General Options tab is shown in the following image. Show Data Labels. Select this option to show data labels on a chart. Clear this option to suppress data labels. Angle. Set the angle of the data label. When the position is set to Custom, you can define the angle properties to create a custom position for the data label. Radius. Set the radius of the data label. When the position is set to Custom, you can define the radius properties to create a custom position for the data label. Note: You can control the display of currency symbols in your chart using the syntax editor. Using the SET CURRSYMB command, you can specify a value for a particular currency which will display in your chart. Supported currencies include: US Dollar (USD), British Pound (GBP), Japanese Yen (JPY), Euro (EUR), and New Israeli Shekel (NIS). This capability applies to all formats for charts. Custom Format. Enter a standard number format pattern for the data label. This option is only available when you select the Use Pattern option from the Format Labels drop-down menu. Style Labels. Click this icon to open the Style dialog box, where you can style text. For more information, see Style Dialog Box. Use the Advanced tab to modify additional data labels properties. The Advanced tab is shown in the following image. Show Zero Labels. Select this option to display zero values in a chart. Clear this option to display all data values except zero. Remove duplicate data labels. Select this option to remove the display of multiple data labels that share the same value so that only one value is shown. Apply color to negative data labels. 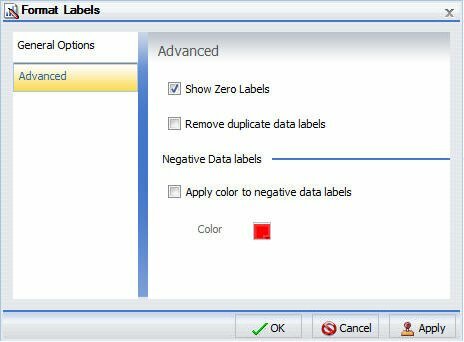 Select this option to style negative data labels separately from positive data labels. Color. Click this icon to open the Color dialog box, where you can select a color for the negative number. There are some options in the General Options tab that are specific to stack charts. The General Options tab for a stack chart is shown in the following image. Show Cumulative Sums. Select this option to have the data text labels show cumulative sums. Clear this option to have data text labels show individual sums. Show Stacked Total. Select this option to display stacked totals. Data position should be set to Center to display a stacked total. Bubble and stock charts share the same General Options and Advanced tabs as bar, line, and area charts, except for the Custom Label option. For pie charts, the General Option and Advanced tabs are replaced by the Pie Labels and Pie Title tabs. Use the Pie Labels tab to customize your pie data labels. The Pie Labels tab is shown in the following image. Label Position. Select from this drop-down menu an option to control the display of feeler lines and labels on a pie chart. Label Display. Select from this drop-down menu an option to control the format of labels displayed next to feelers on a pie chart. Format Labels. Select from this drop-down menu of preset formats that can be applied to labels. Custom Format. Select this option to use a custom format from a list of preset formats. See the following table for a list and description of the characters that you can use in a custom format. Style Labels. Click this button to open the Style dialog box, where you can style text. Ring Label. These options appear on the tab for a ring pie chart. Show Ring Label. Select this option to control the display of the total label on a pie ring chart. Custom Format. Select this option to use a custom format. See the following table. The Format Labels drop-down menu provides a list of preset formats that you can apply to labels. When you select a custom format, it must be defined using a custom format pattern. The following table describes the characters that you can use in a custom format. Divides by 100 and shows as a percentage. Use the Pie Title tab to create and style a pie title. The Pie Title tab is shown in the following image. Show Pie Title. Clear this option to suppress a pie title. Select this option to display a pie title. This is the default option. Style Title. Click this icon to open the Style dialog box, where you can style pie title text. 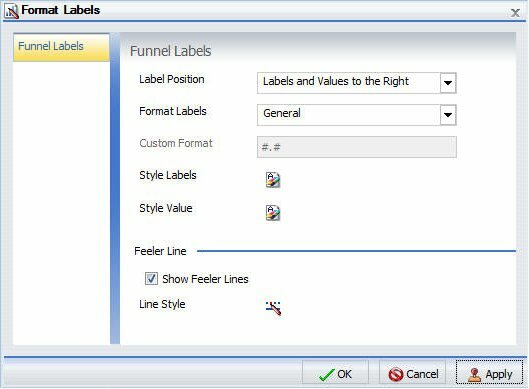 Use the Funnel Labels tab to customize the labels on a funnel or a pyramid chart. The Funnel Labels tab is shown in the following image. Label Position. Select from this drop-down menu an option to control the display of feeler lines and labels on a funnel chart. Custom Format. Select this option to use a custom format. See the table in the previous section for a list and description of the characters that you can use in a custom format. Style Value. Opens the Style dialog box, where you can style the value. Show Feeler Lines. (Default) Clear this option to suppress feeler lines. Select this option to display feeler lines. Line Style. Click this button to open the Line Style dialog box, where you can edit the color, weight, and style of the feeler line. The Style dialog box contains options to style the data labels. The Style dialog box is shown in the following image. Font color. Click the button to open the Color dialog box, where you can select the font color. Note: Reset only works while the Style dialog box is open. Once you click OK, all changes are committed. To undo global styling after it has been committed, you must use the Undo command on the Quick Access Toolbar. The Line Style dialog box contains options to style lines on a chart. The Line Style dialog box is shown in the following image. Color. Click this button to open the Color dialog box, where you can select the color for the line. Weight. Click this button to open a drop-down menu of line weight options. Style. Click this button to open a drop-down menu of line style options. Reset. Click this button to reset the line to the default options. Data Labels. Point to this option to toggle between Show and Hide. More Label Options. Click this option to open the Format Labels dialog box. The right-click menu contains options that are available on the Series tab. Smart Positioning. 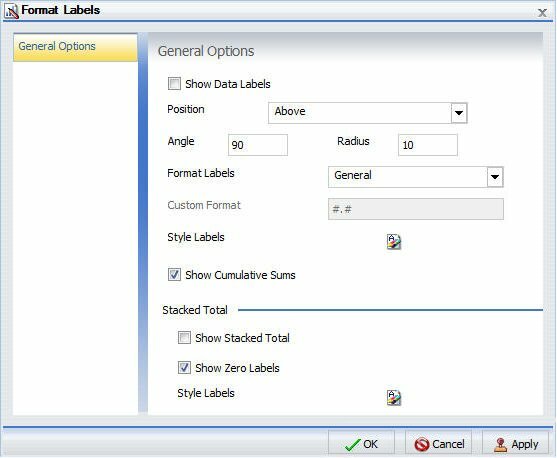 Select this option to use smart positioning of data labels. For example, if a pie chart has so many slices that a data label could become illegible, InfoAssist moves the data label outside of the pie, but connects it to the slice with a feeler line. On Slice. Select this option to display the data labels on the pie slices. Outside Slice. Select this option to display the data labels outside the pie slices. Outside with feeler lines. Select this option to display the data labels outside the pie slices with feeler lines. The following sections contain procedures for customizing data labels. The procedures are organized by the tab and group in which their associated options appear on the ribbon. The Properties group contains commands for enhancing charts, such as changing the type or adding a trendline, for the selected series. 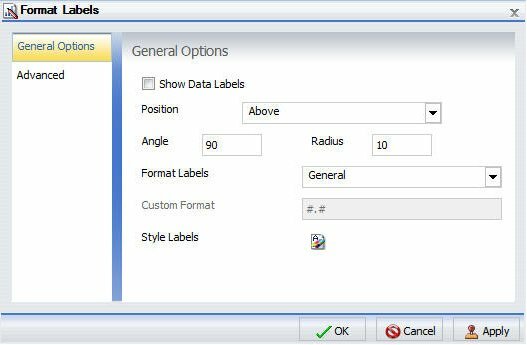 Ribbon: On the Series tab, in the Properties group, open the Data Labels drop-down menu and select More Data Labels Options to open the Format Labels dialog box. On the General tab, select the Show Data Labels option, and click OK to close the dialog box. You can use this dialog box to format and style the data labels. For more information, see Format Labels Dialog Box. To hide data labels, clear this option. Right-Click Menu: Right-click a series on the chart, point to Data Labels, and then select Show. To hide data labels, right-click a series on the chart, point to Data Labels, and then select Hide. The data labels appear, and are formatted and styled accordingly. The following image shows a chart with data labels. On the Series tab, in the Properties group, open the Data Labels drop-down menu. On the menu, select the position for the data labels. The data labels are positioned accordingly. The following image shows a chart with the data labels centered.